Since Windows 8.1 reached GA today, I loaded it up first thing this morning on my Ativ Book 7 to enjoy the much anticipated tweaks that make this Ultrabook even more ultra! However, once I got the update installed, I opened a few applications, including Chrome, and a XenDesktop 7 ICA session using Receiver for Windows and immediately noticed that these apps were blurrier than the desktop or Modern Apps. 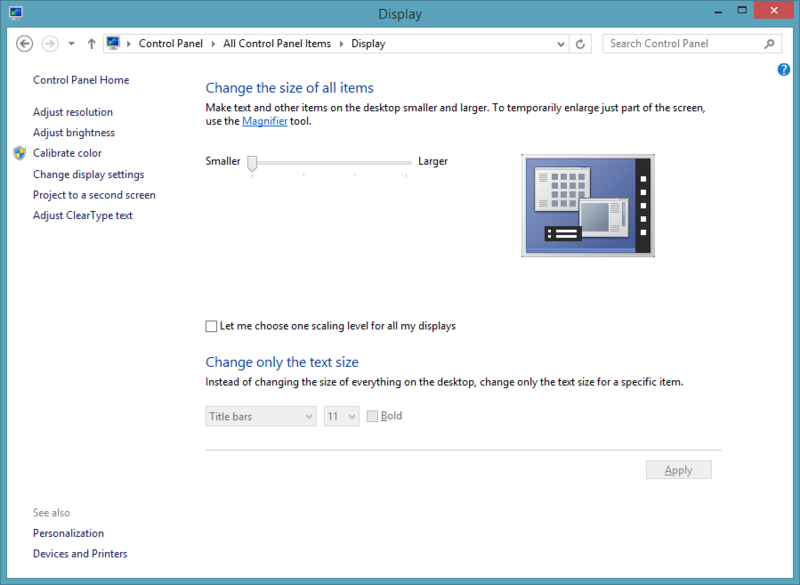 I quickly found that Microsoft decided to enable dynamic display scaling on non DPI Aware programs for high-DPI displays. If you’re interested (like I was) to know more about why Microsoft made this decision in 8.1, you should check out this blog which goes into detail on the topic. UI can scale larger which makes readability better and touch/mouse interactions easier. 200% scaling enables pixel-doubling for up-scaling which provides a clear and crisp appearance for images, graphics, and text. The only caveat to this approach is that DPI scaling is also disabled for Explorer, so the taskbar and desktop will be small as well. Thanks for the thought Microsoft, but please give us an option to do without this feature! I have also a question. in our enviorment we want to use DPi Scaling for User. I have installed the hotfix form Microsoft, that didn’t have solved our Problem. Win 8.1 und Server 2008 r2 with xenapp 6.5 and reveiver 4.1. After every logout form the session the dpi is back to default. Can I solve this issue regarding blurred applications in the Citrix Receiver App in Windows 10 somehow? Sure, it’s actually the exact same process for Windows 10. 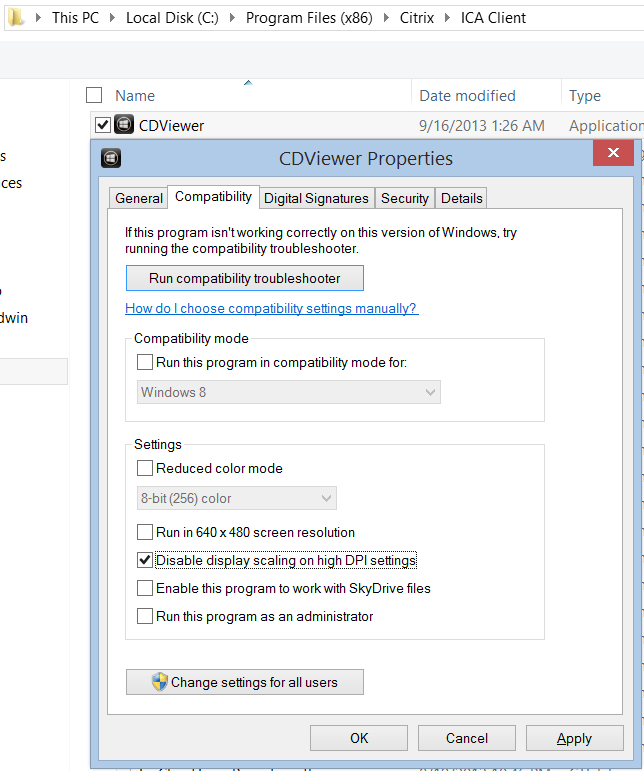 I forgot to mention that I try the Citrix Receiver App from Microsoft Store and I don’t think there is a CDViewer.exe ? I can’t (yet) make it work with the Citrix onlien web plugin as I have been used to. 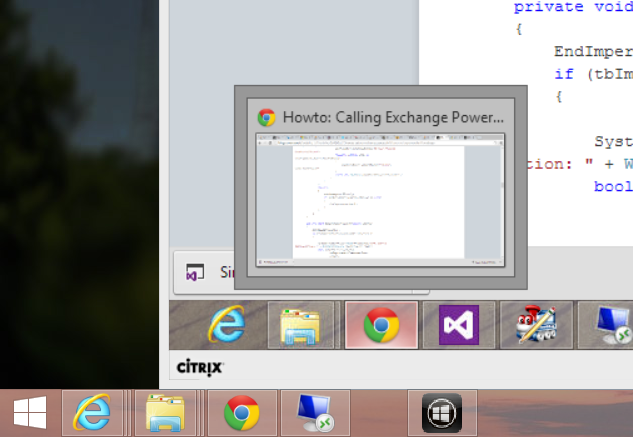 That is why I try the Citrix Receiver App. Ah, changing this on the ‘modern’ app is the same process of disabling DPI-scaling on the executable, but getting to the executable is much different (and more difficult). Then, search for a directory with the word ‘CitrixReceiver’ in it, and look for ‘Receiver.exe’, which is the executable that needs the DPI setting to be disabled. You can also keep your updated DPI settings by using compatibility mode. Running this cmd will allow you to use your existing DPI settings with Citrix and keep the scaling correct.